This is problematic for several reasons. Not only does it show the dent in unemployment rate created by the ongoing purge in Turkey, which has tended to focus on high-skilled occupations like university professors, schoolteachers, etc. 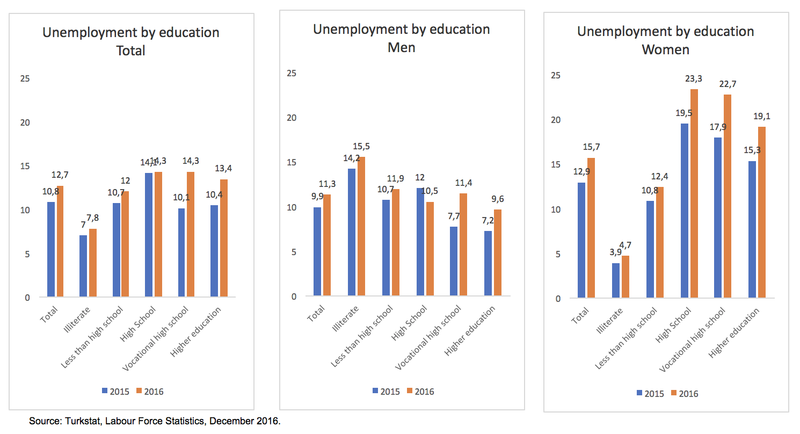 This dynamic is also especially worrisome given the rather ubiquitous two-pronged economic challenges of Turkish policymakers in the labor markets: increasing female employment and reducing a shortage in high-skill labor. Turkey, through its comparatively low female employment rates, is possibly the host to one of the world’s largest ‘talent reserves’ in the world, and there is pronounced need to lower barriers to entry for female labor. Meanwhile, Turkish employers’ have over the years voiced concerns of the difficulty in filling jobs due to talent shortage, and in the Manpower Group’s latest Talent shortage survey Turkey ranked in the 90th percentile among 43 surveyed countries (see graph below). Beyond last years’ purge in the labor markets, recent expenditure policy also raises concerns over Turkey’s future as an innovation economy. The below graph plots World Bank data on expenditures in research & development as a percentage of GDP for Turkey and the Upper middle income bracket. 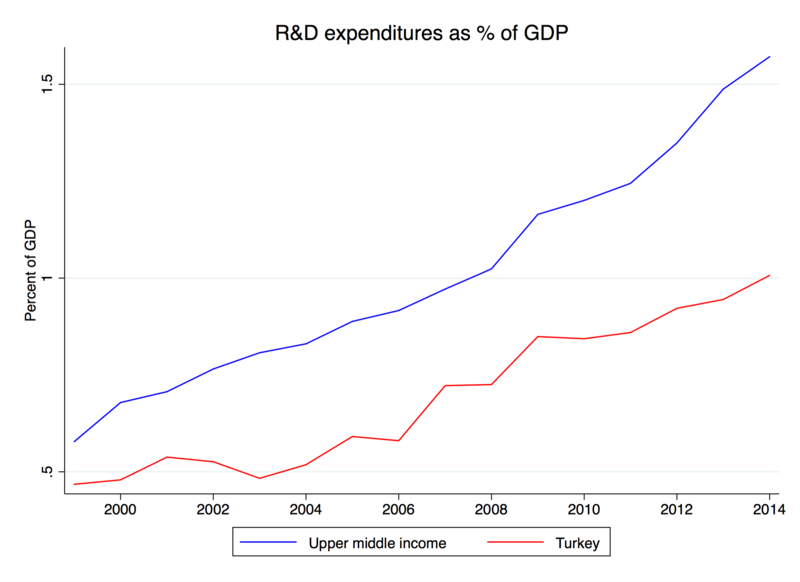 Up until 2009, Turkey’s growing R&D expenditure meant a convergence towards the upper middle income average, but lagging innovation investments in the period afterwards has resulted in a widening innovation gap with Turkey increasingly falling behind. Moreover, despite earlier improvements in education quality measures, below measured by PISA scores, the last couple of years has seen Turkey’s average performance decreasing, and in some cases below their 2006 levels. Shifting priorities in the education system can also be seen in the below graph which plots the trajectory of non-formal education institutions, which shows growth in Koran study centers rapidly outpacing private education centers. In the first ten years of AKP rule Koran study centers grew by 266% between 2003 and 2014, whereas private education centers grew by just 6%. Up until 2006, the latter was outpacing the former but ever since then the recent reversal has been quite significant. A widening skills gap in Turkey, partly due to longer-term policy preferences, partly because of recent political instability, comes at a particularly inopportune moment for the country. Not only would Turkey’s ongoing demographic dividend fail to realize without improving the labor market opportunities for higher-skilled workers, but the spread of automation worldwide has been documented to put downward pressure on employment particularly with regards to “low-skill and medium-skill occupations”. 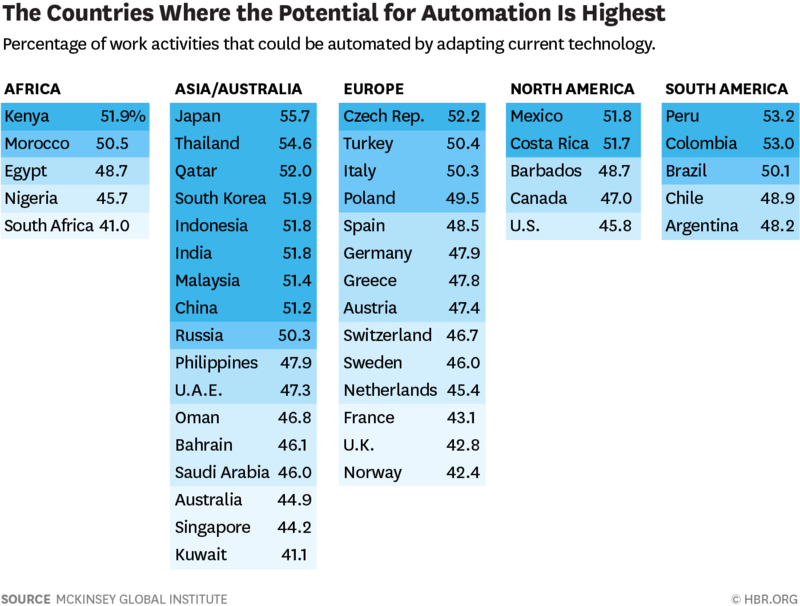 Recent research by McKinsey Global Institute puts Turkey as the country with the second-highest share of work activities that could be automated. As the automation revolution approaches Turkey, it appears to be poorly prepared for it. In short, Turkey’s ongoing purge is not only detrimental for human rights and political reasons. It also seriously jeopardizes its economic future and its chances of escaping a middle income trap.